COMPANY: Cinemanaut Bill and my roommate Ben. PHYSICAL AND MENTAL STATE: Still distracted and having difficulty focusing on the film. 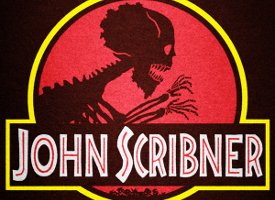 There exists a facility, all but inaccessible, where wonders are being created. Wonders which could not only give great joy to the world’s children, but which could provide wealth untold to whoever possesses them. No competitors have succeeded in keeping up with the inventions and discoveries that this facility has been able to produce. The agent of one of these competitors approaches a man voraciously dining. He has an offer. If the diner can successfully extract a sample from the facility, the monetary reward would be exorbitant. No, I’m not talking about Lewis Dodgson. I’m talking about Mr. Slugworth from Willy Wonka and the Chocolate Factory. At least Gloop has the decency not to deface anyone’s pie. During this viewing, Bill posed the question of whether it was possible that Dodgson was pulling a Slugworth, i.e. pretending to work for a competitor in order to test someone’s moral fiber. I’ll get back to my thoughts on that a little later. 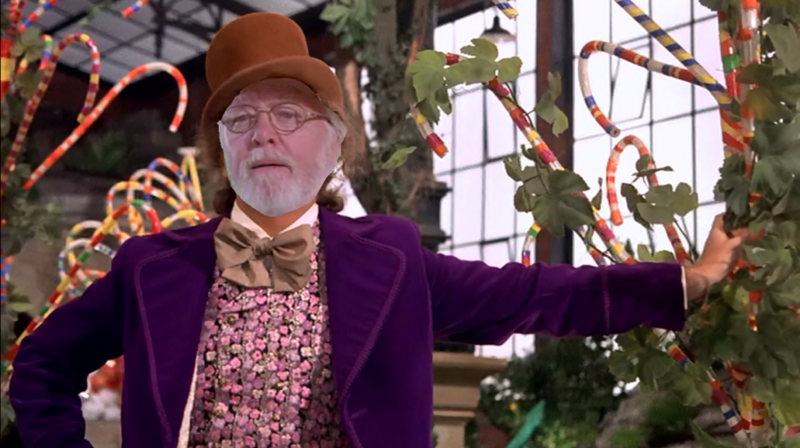 The comment inspired me to take a look at the similarities between Jurassic Park and Willy Wonka and the Chocolate Factory. 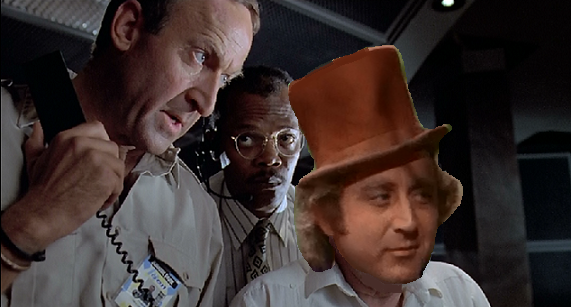 Hammond and Wonka are eerily similar. They are both rich elderly gentlemen who have built fantastic facilities full of wonders designed, in Hammond’s words, to “drive kids out of their minds.” They both saunter around with fancy canes (though Wonka doesn’t seem to need his) and their facilities both have alarmingly poor safety precautions (though Wonka doesn’t seem to give two shits). Something like this, I imagine. 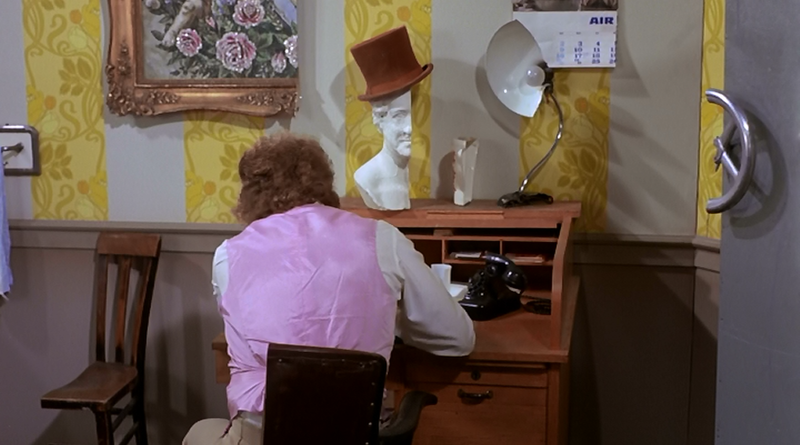 As we all know, four out of five children who visit Wonka’s factory suffer horrible accidents. 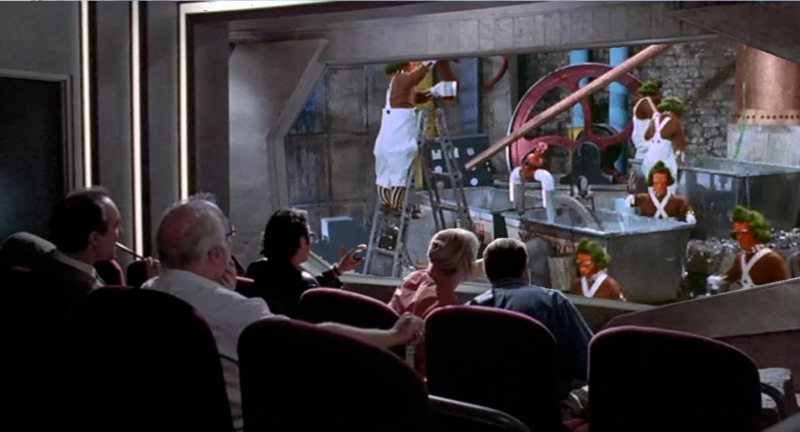 What separates these misfortunes from Jurassic Park’s similarly high casualty rate is that the children at Wonka’s suffer because of their own undesirable habits. 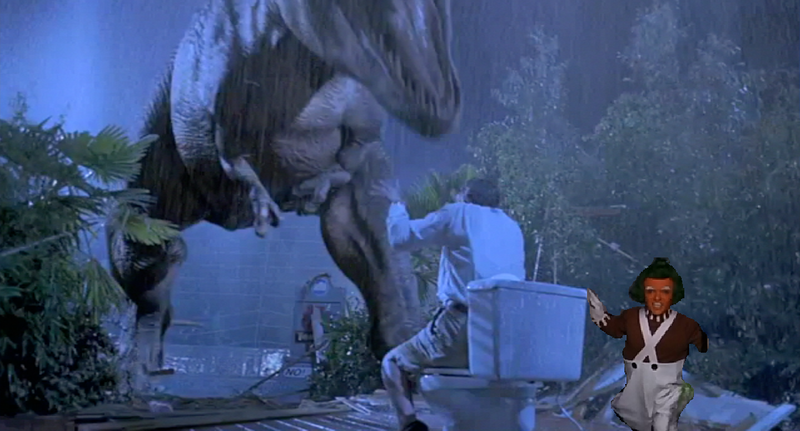 Jurassic Park was designed to be safe, things just got out of control. 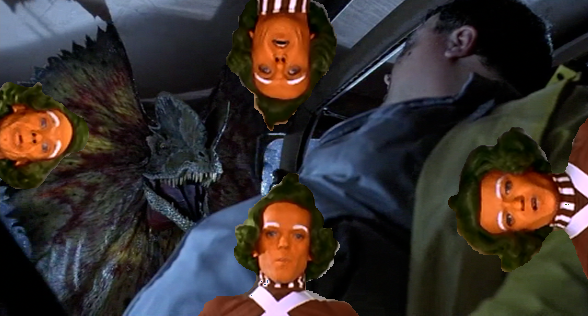 Wonka, on the other hand, uses clever traps to cull over-eaters, gum-chewers, brats, and couch potatoes from his herd of potential factory inheritors. Creepy as this graphic is, it isn’t creepy enough to accurately reflect Wonka’s horrible reality. 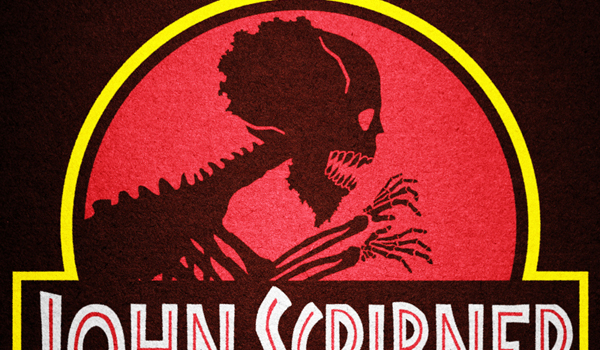 But are the deaths in Jurassic Park really so random? Is there, for example, a worse habit than leaving two children alone in a SUV with a dinosaur running loose? Here’s where things fall apart. Muldoon and Arnold don’t have any major marks against them, yet are brutally killed anyway. 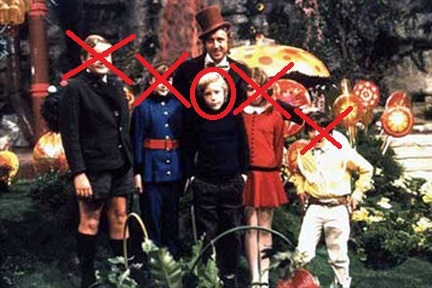 Perhaps Wonka and Hammond are the type of people who don’t really need a reason to kill. 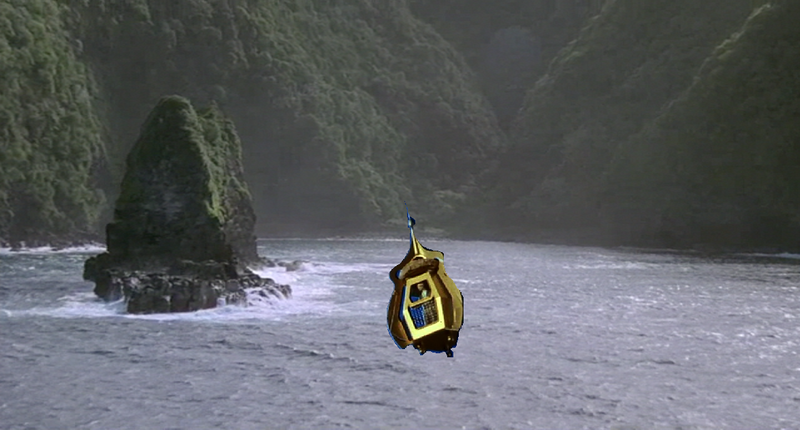 The only good option is to get the hell off that island. Before he decides to clone some Vermicious Knids. Wait, what were we talking about again? Oh yes, Dodgson as a Slugworth-esque double agent. I don’t see any real evidence for it. Do you remember that scene where Hammond takes Nedry on a frightening boat ride and an image of Dodgson flashes onto the walls? No, neither do I. Hammond could have stocked the freezer with fake embryos and planned some sort of “ah ha, I caught you, you can’t be trusted” type of thing, but it really doesn’t seem to fit his character. The whole idea, while interesting, is quite silly. I spared half the expense.